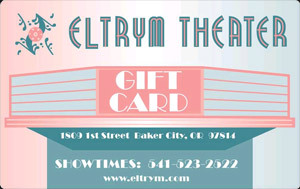 Gift Cards are a very flexible way to give that special person an entertaining time out to Baker City's Historic ELTRYM THEATRE. Gift Cards fit nicely in a birthday, anniversary, or thank you card for a hard-working employee. Our NEW Gift Cards have the same look, feel, and function as a DEBIT CARD. Put any amount of money on the card, then use the card to purchase movie tickets and concessions. Cards can be "recharged" and reused for as often as you like. Stop by the Theater or shop online to purchase your Movie Gift Cards today!